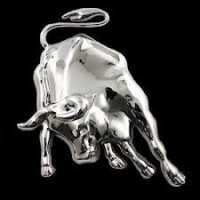 Many investors believe the value of silver will surge much higher in percentage terms compared to gold during the next financial and economic crash. I happen to belong to that savvy group of silver investors, and for good reason. If we look at the charts below, the data proves that silver is certainly the more undervalued precious metal asset. Thus, it will likely make silver one of the best investment strategies of a lifetime. While some readers may say that this is just more hype, the fundamentals provide us a pretty clear picture. That is, if we are able to understand the entire system and how things are likely to unfold. Before I post these two charts, I want to say a few words about several emails I have received from my readers over the past week. After I wrote the article, UNLOCKING GOLD’S TRUE VALUE: The Economic Code – Finally Revealed, some readers finally understood that ENERGY is the critical factor in providing value to most goods and services in the world. When they find out that ENERGY is everything, the LIGHT-BULBS go off and they finally get the vital importance. It took me years of research before it made sense to me. Still, the majority of my readers likely just skip over it and continue to see energy as just a part of the economy. Even mainstream analysts separate the Energy Sector from the Health Care Sector, the Manufacturing Sector or even the Service Industry… so on and so forth. They look at energy as just a mere segment of the market. For some strange reason, they believe the Health Care, Manufacturing and Service sectors are powered by Fairies or Elves. I can assure you, all sectors of the market are run by energy. Take energy away, and Apple’s products and stock price would get flushed down the toilet. When precious metals investors finally realize that ENERGY is the KEY to everything, they will no longer worry about gold and silver manipulation, the Federal Reserve FOMC meetings, the One World Government or dozens of other distractions. I continue to read and hear about the ONE WORLD GOVERNMENT and how Globalism is going to rule the world. I would like to kindly remind those reading this article that globalism was a short-term arrangement only possible due to cheap and abundant oil production. As U.S. and global oil production heads south in earnest over the next 5-10 years, globalism will experience the same fate as the Dinosaur. Conspiracy theory obsessed Americans in the future will no longer worry about the Global Elite and their One World Currency (for example), but rather if their neighbor is stealing their vegetables from their garden at night. Basically, fear or worry will move away from GRAND CONSPIRACIES to more practical day-to-day local or regional living situations. Mark my words on this…. Anyhow, I am glad some readers are finally connecting the dots that energy is the key to everything. That being said, there has been a lot of chatter over the years in the precious metals community that there is more gold investment in the world than silver. I actually have stated this a few times myself. So, I thought it would be a good idea to check this out and to see if it was true. If we go by the data from GFMS (Gold Fields Mineral Service), which is now apart of the Thomson Reuters conglomerate, and the CPM Group, total world official gold and silver investment holdings are a lot closer in range than I originally thought. NOTE: I decided to use the data from the CPM Group’s 2016 Silver Yearbook because they are the only source that provides an estimated total for silver. Of course, this data has to be taken with a grain of salt, but it does at least provide us with a decent estimate. This was found on Wikipedia, but the source was published by the USGS based on data from the World Gold Council. 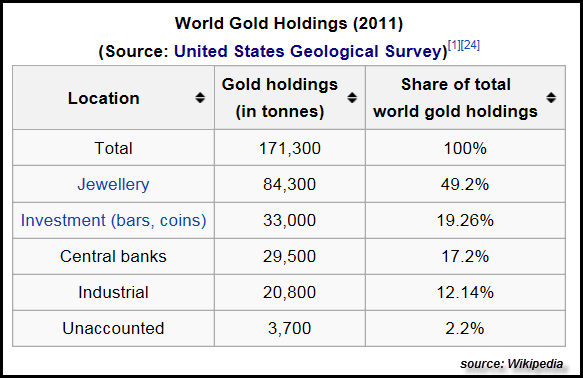 Wikipedia also provided updated Central Bank gold holdings as of June 2016. I then added the additional 5,000 tonnes of gold bar and coin demand from 2012-2015. Basically, total gold investment in the world is approximately 70,000 metric tons (mt). This translates to a cool 2.25 billion oz. According to the CPM Group’s 2016 Silver Yearbook, they estimate total silver bar and coin inventories in the world at 2,539,000,000 oz or 2.54 billion oz. They break it down to 1.58 billion in silver coins and 961 million oz in silver bars. This figure looks about right to me, but of course, it’s an estimate. There could be more silver bullion held privately that we don’t know about, but that could also be true for gold. 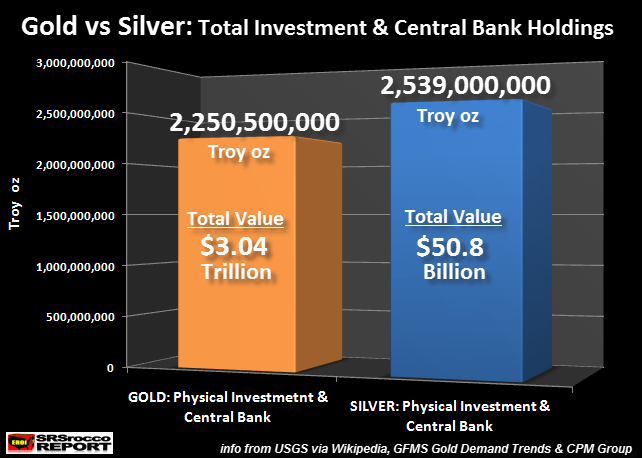 Regardless, there is about 290 million oz more silver investment in the world than gold. Thus, according to these official sources, there is 13% more silver investment inventories than gold. However, that is not all that much when we compare the value of both. I arrived at the total values in the chart above by multiplying a gold price of $1,350 and silver price of $20 by their total respective inventories. As we can see, the total value of gold investment inventories equals $3 trillion versus a measly $50.8 billion in silver. So, when the trillions of Dollars of Fed liquidity no longer works, as the monetary crack addicted economy finally crashes, investors fleeing stocks and bonds will finally find out just how little silver investment there is in the world. The funneling of massive funds into silver will drive up the value much higher than gold. Thus, $10 billion dollars flowing into the world gold investment market will push the total value up one-third of a percent (0.3%), while that same $10 billion into silver will push up the total value by 16%. That is, if the price of silver remained the same. If we trust the estimates by the official sources, Central Banks hold a massive 1+ billion oz of gold compared to 46.8 million oz of silver. 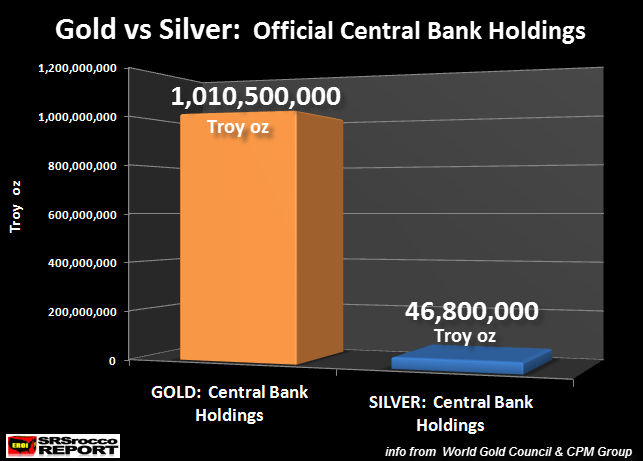 Roughly, Central Banks hold 22 times more gold than silver. The U.S. Treasury and other (mostly) Western Central Banks unloaded their massive silver stockpiles 50+ years ago, when they (mistakenly) realized silver was becoming way too valuable to be used as a currency and that it’s citizens wouldn’t mind using base metal slugs for trade. Let me start with a few words for the Grand Conspiracy Skeptics. I would imagine many readers rolled their eyes at the information above because “THEY KNOW BETTER.” Well, maybe they do. For example, some analysts are stating that the Chinese Govt holds upwards of 30,000 mt of gold… much higher than the official figure. Furthermore, others believe the U.S. Treasury holds very little of their supposed 8,133 mt of gold reserves. Sure, this may be true, but this gold had to come from existing investment stocks. If the Chinese do have a lot more gold, maybe a good portion came from U.S. Treasury stocks or from private investors who still to this day, don’t realize their allocated or unallocated gold was sold or leased right out from underneath them. This would not change the overall figure of physical gold investment, rather it only changes the amount individual Central Banks or private investors own. Now, for those individuals who believe in the Grand Conspiracies put forth by Bix Weir and other assorted Gadflies (really don’t mean to disrespectful here) that the world has more like 1-2 million tons of gold floating around, there isn’t much I can say to change your opinion. You are likely to take that PEARL of a lousy conspiracy to the grave with you. This is due to the seemingly religious indoctrination of lousy conspiracies such as Yamashita’s gold, and the massive Marcos gold hoard in the Philippines. I have looked over the documentation and I could see why some folks would believe these fanciful stories. However, if we go by science, we find that it was impossible to mine that much gold unless we had assistance from space Aliens from galaxies far, far away. 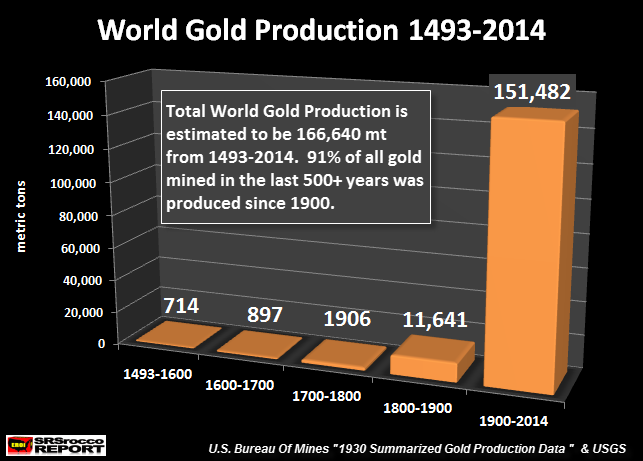 According to the detailed data put out by the U.S. Bureau of Mines 1930 report and the USGS, the overwhelming majority of cumulative world gold production came since 1900. Why? Because we tapped into massive oil reserves containing thousands of energy slaves in each barrel. As global oil production increased exponentially, so did the mining of gold, silver and just about every other metal. No magic here… just real science if we allow our brains to absorb facts rather than lousy conspiracy gossip. While the figures in the chart are not 100% accurate, I would suggest a 10-20% error of accuracy would be reasonable to assume. Thus, total world gold production of 166,640 mt could be closer to 200,000 mt. However, there is no way the world is hiding 1-2 million metric tons of gold in some cellar, basement or underground Nazi bunker. While conspiracies do take place in our world, not everything is a conspiracy. If we use some logic and reasoning, many lousy conspiracies should be put to DEATH once and for all. Unfortunately, writing about real and lousy conspiracies is a good way to make a living selling newsletters. While I have no reservation with an individual making a BUCK (Dollar) discussing more viable conspiracies, I find the peddling of lousy conspiracies distracts people from the real problems at hand. You will notice how much gold is estimated to be held in jewelry (includes religious objects and artwork). There’s actually more gold held in this category than in both investment and Central Bank holdings. While jewelry is not an actual investment inventory, a lot of that gold jewelry could come back into the market if the price of gold started to head towards $5-$10,000. 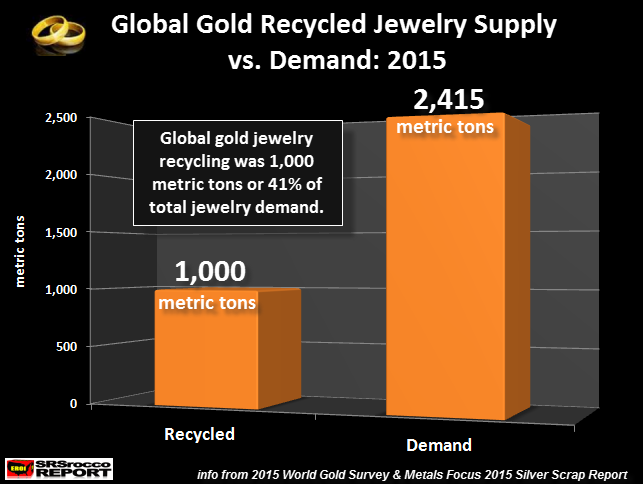 According to the sources shown at the bottom of the chart, there was nearly two times more gold jewelry sold back into the market as scrap supply in 2015 (1,000 mt) versus silver jewelry (551 mt). So, a good percentage of the gold jewelry held by citizens throughout the world could come back into the market if the price or value of gold surged higher. This would also be true for silver. 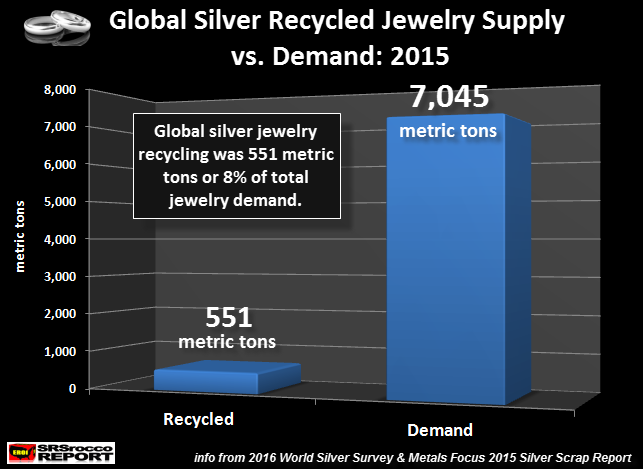 However, a lot of silver that was made into jewelry over the years may have been discarded into the thousands upon thousands of landfills in the world due to its insignificant value. When Americans get into a CLEAN UP MODE at their house, they will likely throw out silver jewelry because it’s just a part of the staggering amount of junk and clutter that accumulates over the years. On the other hand, if they came across an old gold ring, then of course they would consider taking that down to the pawn shop so they could head to Las Vegas for the weekend for a much needed rest from the RAT RACE. Regardless, most of the available gold on the planet is still held by citizens throughout the world. However, upwards of half of the silver is likely gone forever as industrial waste in landfills or still being used in electrical functions in the hundreds of millions of homes, cars and electronics throughout the world. Very little of this silver will ever be recycled. Investment funds moving into silver will push its value up much higher than gold in percentage terms due to its low price. While there isn’t more gold investment in the world than silver (according to official sources), silver inventories only outweigh gold by 13%. This is insignificant when we consider its low price or value. There is 22 times more gold held by Central Banks than silver. When the mad scramble to own precious metals finally takes place… don’t count on Central Banks to help much with silver supply. There are several more factors I could list, but these are by far the most important. Furthermore, I could write several additional articles just on clarifying the official figures in more detail… but it’s more important to understand the overall trend. Precious metals will be the go to assets due to their ability to store ECONOMIC ENERGY. The current $250 trillion in global stocks, bonds, real estate and insurance funds are not stores of economic energy… rather they are economic energy IOU’s. These energy IOU’s worked find (sort of) during the rise of cheap energy production. However, they will collapse as the opposite takes place. Protect your wealth; invest in physical gold, silver or other precious metals at best prices from Indigo Precious Metals. 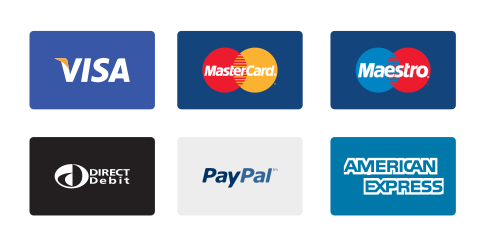 Physical delivery in Singapore, Malaysia, UK, Europe or worldwide. Consider the safest option of segregated, allocated vault storage at Le Freeport Singapore with IPM Group.